Beautiful view to Elounda on the wonderful room patios. Well decorated and very clean. The room views and Balcony / location/ hosts. Location, friendliness of owners/staff, peaceful, comfortable space with great verandas and close enough to Elounta for loads of restaurant choice but remote enough to be peaceful. This property exceeded our expectations! The approach was magical, over a stone bridge to a peninsula where this is the only habitation. Lovely walks to remote beaches, brilliant for snorkelling. A lovely family run cafe selling delicious & wholesome breakfasts and snacks through the day. Then a beautiful stroll along the seafront into Elounda for dinner.....all the ingredients for a perfect holiday! Fantastic,quiet location. So relaxing. Great , warm family atmosphere . We really loved it & will be back. Thank you. This is our second time at Elounda Island Villas, whose charming hosts have created a little oasis of peace and beauty, reached across a narrow causeway, splashed by waves - with gorgeous views and private rocky coves, sparkling turquoise. Quiet location great. Nice 15 mins walk to great restaurants and facilities of the town. Staff very welcoming, friendly and informative. Had a very relaxing time. 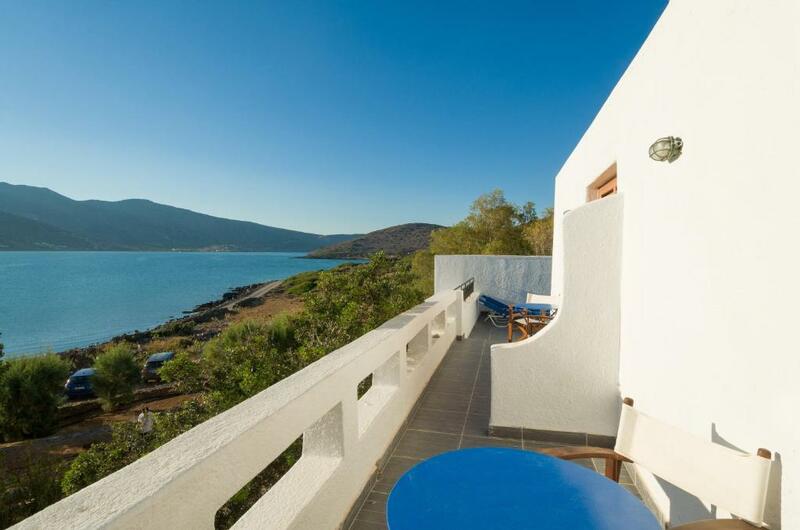 Peaceful, sympathetic to location, next to the sea, fabulous view of Elounda and sunset over the mountain. The location was just perfect - out of town with gorgeous views back over to Elounda, but still in walking distance to the shops and restaurants. Five minute walk to the nearest beach. The villas are lovely - not super fancy but with everything you need and well cleaned. Lida and Costa go out of their way to make you comfortable and to ensure you have a great holiday. 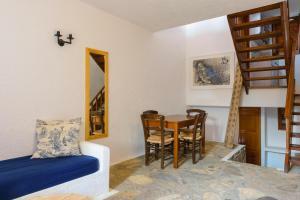 Beautiful villa with comfortable bed and sofa and a lovely terrasse with chairs and a table. Lovely garden with sunbeds. Beautiful nature and surroundings. The quietness. And not least the friendly and helpfull hosts. The nice cafe with good food. In short everything. 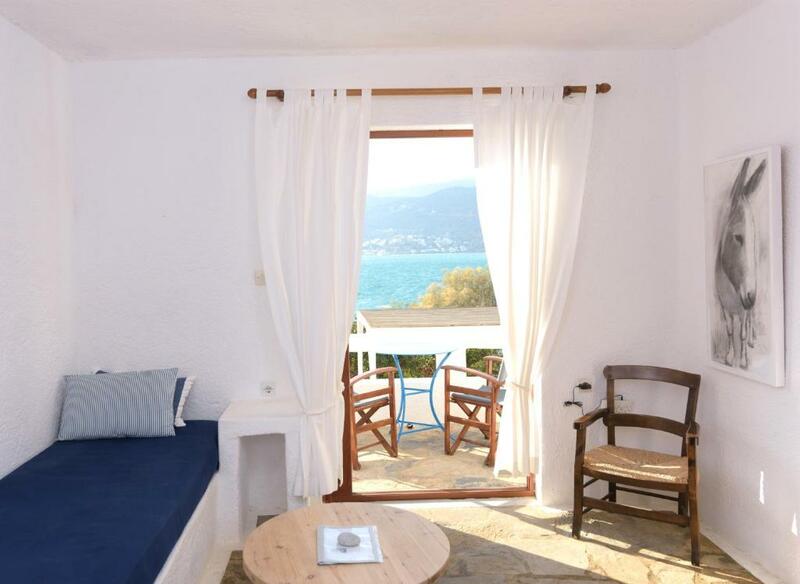 Lock in a great price for Elounda Island Villas – rated 9.2 by recent guests! 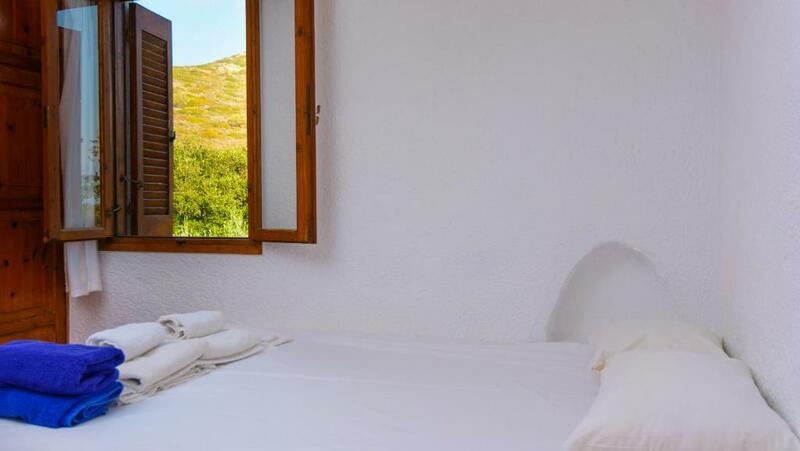 Elounda Island Villas offers secluded apartments with a small beach, on a rugged island off the coast near Elounda. 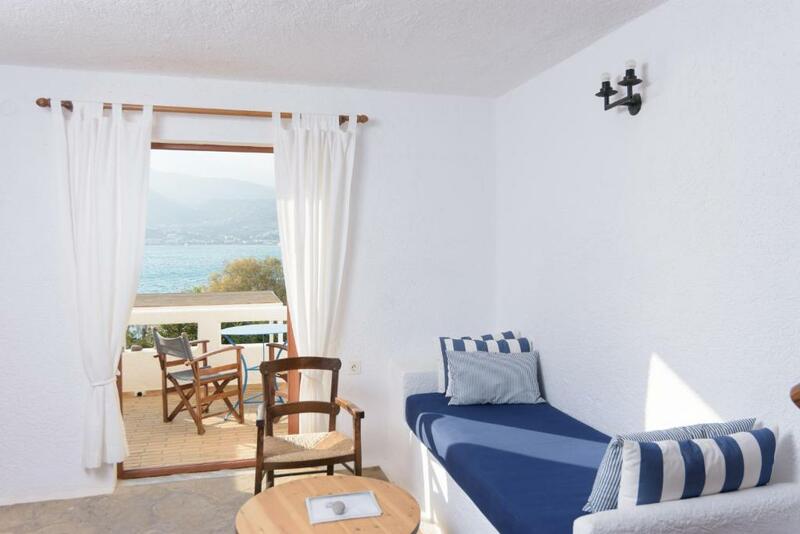 Enjoy crystal clear waters on your doorstep and views over Elounda Bay from your balcony or patio. 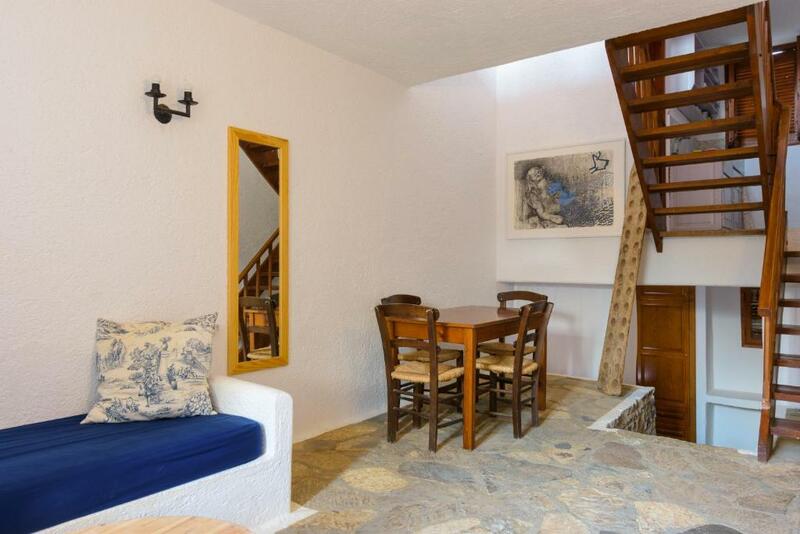 The family-run apartments are simply furnished, with pine tables and chairs, stone or tiled floors, cheerful cushions and curtains and built-in beds. Each has a kitchenette and a bathroom. Electricity comes from photovoltaic cells which heat the shower water and power the eco-friendly lamps. There is no heating or air conditioning. For provisions, the center of Elounda is a 20-minute walk. Connected to Elounda by an old stone bridge, Elounda Island Villas is the islet’s one and only building. It sits 350 feet from the bridge, with a small, safe, sandy beach in front. If you want action, nearby Elounda offers bars, shops and boat trips to the island of Spinalonga. Bustling Agios Nikolaos is only 10 minutes' drive away. 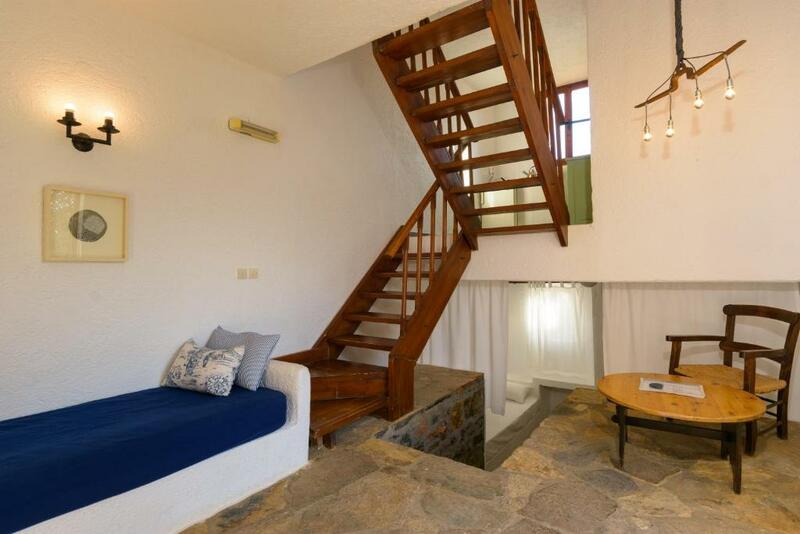 When would you like to stay at Elounda Island Villas? This apartment has a toaster, balcony and sofa. This apartment features a sofa, balcony and patio. This apartment has a patio, sofa and kitchenette. This apartment features a toaster, sofa and balcony. This apartment features a sofa, balcony and toaster. House Rules Elounda Island Villas takes special requests – add in the next step! Elounda Island Villas accepts these cards and reserves the right to temporarily hold an amount prior to arrival. Please inform Elounda Island Villas of your expected arrival time in advance. You can use the Special Requests box when booking, or contact the property directly using the contact details in your confirmation. The only thing that could have made it better would have been a pool on site, but with the sea all around it is not strictly necessary. As long as you aren't expecting a lot of white sandy beaches (and if you've done any research, you shouldn't), nothing to not like if you want a quiet relaxing holiday. The kitchen was poorly equipped if you want to cook your own meals rather than eat out. The setting is totally unique and very beautiful and peaceful. The bed and seating area was extremely comfortable. Spacious villas decorated with care and good taste, with all comforts. Kolokutha beach nearby, cafe at the hotel offers good option for breakfast. Very close to Elounda centre, but still at the most calm location. Beautiful view to the sea from the room. Very friendly and warm welcome from Lida, the owner and the staff.